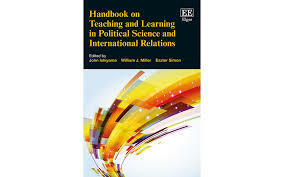 I’ll begin a series of posts on curriculum design with a brief review of the Handbook on Teaching and Learning in Political Science and International Relations, edited by John Ishiyama, William J. Miller, and Eszter Simon (Edward Elgar Publishing, 2015). Be forewarned that this snapshot review is probably biased given that I’m the co-author of one of the book’s chapters. I commend the editors for ensuring that all the chapters in the book are concise and directly relevant to teaching. There is a complete absence of the convoluted verbiage that normally characterizes writing by academics. Chapters in the Handbook neatly flow from curricular structure to teaching particular subject areas to classroom exercises. Both beginning and experienced practitioners will find topics like effective syllabus design, course-based writing, and best practices when lecturing incredibly useful. My one criticism is the very occasional inclusion of bogus assertions that have established themselves as “fact” in much of the political science pedagogical literature. A good example is the quotation on page 158 from Baranowski (2006), who cites Stice’s (1987) statement that “students retain only about 10% of what they read and 20% of what they hear [but] up to 90% of what they do and say.” This claim was thoroughly debunked in 2008 by Keith E. Holbert and George G. Karady of Arizona State University. That said, I believe book ought to be a standard tool used in the training of political science doctoral students, along with Classroom Assessment Techniques by Thomas Angelo and Patricia Cross.